GREENVILLE, N.C. – Nice read by The Greenville (N.C.) Reflector about the relationship between East Carolina offensive coordinator Donnie Kirkpatrick and Pirates’ quarterback Holton Ahlers. Kirkpatrick is back at ECU for a second stint as a coach there. He’s a former multi-sport star athlete at old Granite Falls High and on the first teams at South Caldwell High, playing for his father, Don (Red) Kirkpatrick, and his brother, Marc, is head football coach at their alma mater. South Caldwell’s first football team reached the state 3A title game before losing. Kirkpatrick played college football at Lenoir-Rhyne University and his coaching resume includes assistant coaching jobs at Appalachian State, South Carolina, Eastern Michigan, Louisville, Chattanooga, ECU, James Madison and back to ECU. He spent three seasons as head coach at Chattanooga. Kirkpatrick is offensive coordinator under Mike Houston, who left the head-coaching job at LRU to become head coach at The Citadel. 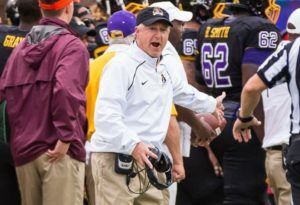 Houston left The Citadel for James Madison, where he won a national title with Kirkpatrick on his coaching staff, and Houston was named head coach at ECU last December. The Pirates’ debut under their new coaching staff comes Aug. 31 at N.C. State.